I was looking for a dark read. This was not it. The Story of Owen is actually very fun and light, not at all what I imagined. It is full of banter and heart and imagination, but also terrifically grounded in the real world. I believe that it is supposed to be geared towards young adults but I think middle schoolers will probably like this more. It was a beautiful story, with a beautiful sense of place and history and intriguing characters. I really enjoyed the main two characters themselves, Siobhan and Owen, and the bond of loyalty that grows between them. They’re likeable and talented in their different ways, without ever feeling unrealistically good. I was surprised that Siobhan was the narrator of the story but yet somehow the story of Owen is very much her story as well. I enjoyed the way that Siobhan told the story and figuring out her place in his story without having to be romantic. She is figuring out what she needs to do to help him. Not sure when I will get to book 2, but it has been added to the pile. This entry was posted in Fantasy, Middle Grade and tagged E.K. 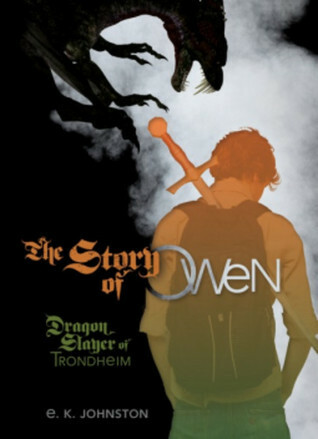 Johnston, The Story of Owen: Dragon Slayer of Trondheim. Bookmark the permalink.